Do you like quesadillas? Of course you do. It's impossible to resist that warm gooeyness paired with the perfect amount of spice and crunch. Now imagine how awesome they'll taste hot off the George Foreman Quesadilla Maker. It creates 10-inch quesadillas packed with your favorite ingredients in just 3-4 minutes! Deep-dish pockets hold loads of cheese, salsa, and meat, and the outer ridge seals everything in for mess-free snacking. Plus, the nonstick cooking surface wipes clean in no time, so you can fill your quesadilla cravings time and time again without the hassle. 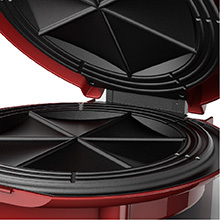 The 10 inch circular cooking surface is perfect for stuffing your quesadilla with all your favorite ingredients! From plate to mouth without the mess! 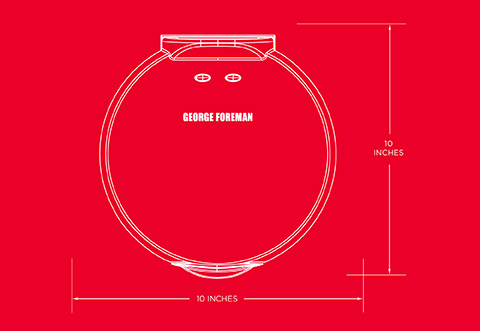 The 10 inch circular cooking surface is the perfect arena for cooking quesadillas. The Surface is nonstick for a no-hassle clean up or quick turn around to make a second quesadilla. Thanks to the non stick surface, cooking without grease is easy and better for you. Plus, clean up is that much easier! 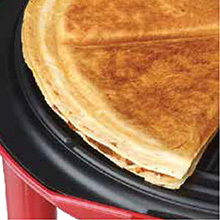 The press and seal lines along the edge of the quesadilla maker ensure the heat will stay in for quick and even cooking. They also help all ingredients stay in place for great results! Green means go! Indicator lights on the top of the machine let you know when it’s plugged in and when it’s ready to cook. 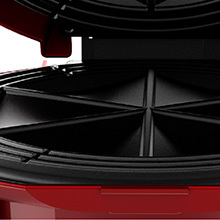 The cooking surface's deep dish locking lines are great for stuffing your quesadilla with all your favorite ingredients! The lines also act as a cutting guide after cooking - perfect for simple serving. Red Quesadilla Maker is rated 2.4 out of 5 by 17. 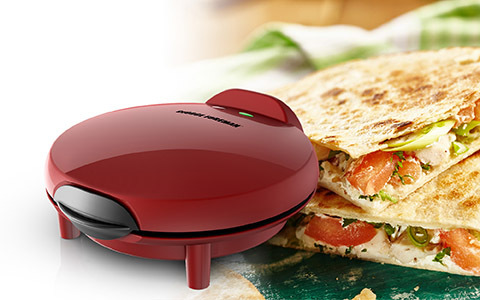 Rated 2 out of 5 by Kristen1234 from Handle Broke We loved this quesadilla maker the first time we used it. It was so easy and made great quesadillas. However, the second time we used it the handle broke off and it doesn’t cook evenly now. I haven’t had it even a month yet. Can it be returned or replaced? Rated 2 out of 5 by SJohnson from Loved it first use and then it broke the second! I just received this unit two days ago and it was great first use. On the second try the handle broke and it doesn’t lock in anymore. Disappointed in quality. 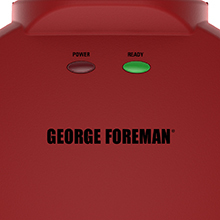 Rated 1 out of 5 by Jwest123 from Handle Replacement I bought a George Forman Quesadilla Maker last year and have used it only a handful of times. Very disappointed that the handle has broken and we can no longer lock it when cooking. I do like the deeper sections but quite displeased the lock has broken. Can you send me a replacement part? Rated 2 out of 5 by TamiG from Like many others my latch broke :-( We've loved this for the 9 months we've had it but even with using it about once a week the latch broke and now it doesn't cook evenly if you have more than cheese in the quesadilla. 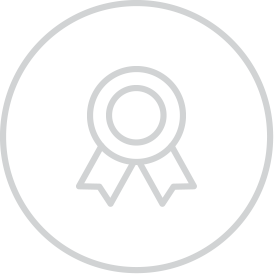 Rated 5 out of 5 by Mike1111111 from Works perfectly, makes a great meal fast! I purchased this without much hopes but was pleasantly surprised after using it the first time. I continue to use it because I can throw together a Quesadilla in a matter of minutes. I get to choose the ingredients and cook it exactly the way I want it. It cleans easily with a paper towel. The only thing I wish they did was have a spring loaded hinge in the rear which will allow it to cook thinker Quesadillas. I would absolutely recommend this appliance to anyone! Rated 2 out of 5 by Real Unhappy from Broken Handle After about 8 or 9 uses the handle broke off. How do I get replacement parts? Or my money back? 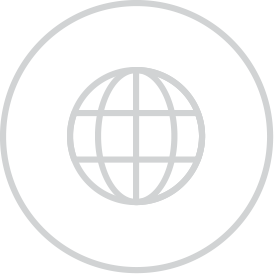 Please help. It was a great quesadilla maker until the handle broke. Rated 4 out of 5 by Michael G from browns great but latch broke on 2nd use On second use the latch broke and a piece fell into the quesadilla, glad I did not break a tooth. Can you remedy this problem please because I will use this a lot if working properly. Rated 1 out of 5 by Stella from Broken Latch I bought this for my parents mid May and the latch broke the 2nd time used. They were extremely disappointed. Is there any way to replace the latch? Please advise.